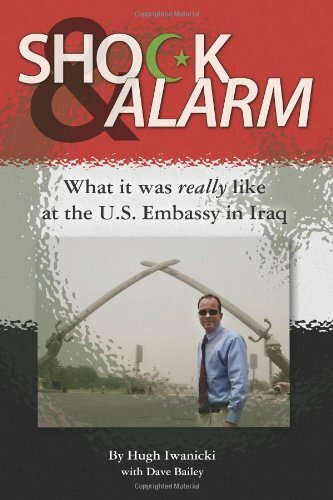 Shock and Alarm: What it was really like at the US Embassy in Iraq is a riveting behind-the-scenes exposé of daily life at the Baghdad Diplomatic Compound in 2009, providing an insightful look at the culture clash taking place between the Islamic world and the West. This is Hugh Iwanicki's personal story of the eleven months he served as a performance auditor for the Office of the Inspector General at the Embassy. His journal of unforgettable experiences juxtapose the mundane with the bizarre, moving from discussions of constitutional law with Sharia attorneys to several near-death experiences, as well as the strange bedfellow’s tale of a regional embassy housed in a Shiite-owned "Temporary Marriage Honeymoon Hotel." For comic relief, there are also the misadventures of the Blackwater contractors, Marines, diplomats, and plumbers who inhabited the Green Zone and made the best of the Coalition embassy parties, where the women, though far outnumbered, were in full control of the men. And then there’s the story of how the Embassy got an unlimited supply of free beer, thanks to a Sharia law against alcohol. Iwanicki’s startling autobiographical account brings to light the human, the brutal, and the bewildering sides of life among the Iraqis, Jordanians, and Kuwaitis, as well as the mind-bending ironies and paradoxes encountered by the jumbled crew that lived within the confines known as the US Embassy in Iraq. Shock and Alarm pulls back the curtain on the bunker mentality of "the prison," where a grinding monotony was pierced by near-daily rocket attacks and week-long sand-storms. It also reflects on Iwanicki’s first-hand experiences of the Middle East's Islamic culture, framing disturbing questions about America’s engagement in Iraq and with Islam itself. While readers of all backgrounds and interests will enjoy the fish-out-of-water humor of Iwanicki’s early adventures in Iraq, little will prepare them for his climactic awakening to a horror hiding in plain sight. Iwanicki’s story ends with a silent scream, as he discovers that the menace he thought he had escaped by returning to the US was awaiting him at home. Shock and Alarm is an urgent and heartfelt memoir that provides a much needed wake-up call to all Americans.